The more I watch Clara Bow (and read about her), the more convinced I am that this woman was a performing genius --- not one of those "instinctive" talents, mind you. That’s always struck me as a somewhat condescending term applied to actors considered too stupid to comprehend their effect on an audience. 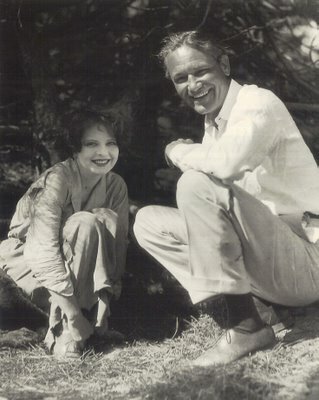 Clara Bow understood exactly what she was doing. Her grasp --- her technique --- was never any accident. This was not some dumb animal taught by force of repetition to go out and fetch a stick, although she was certainly treated like one. 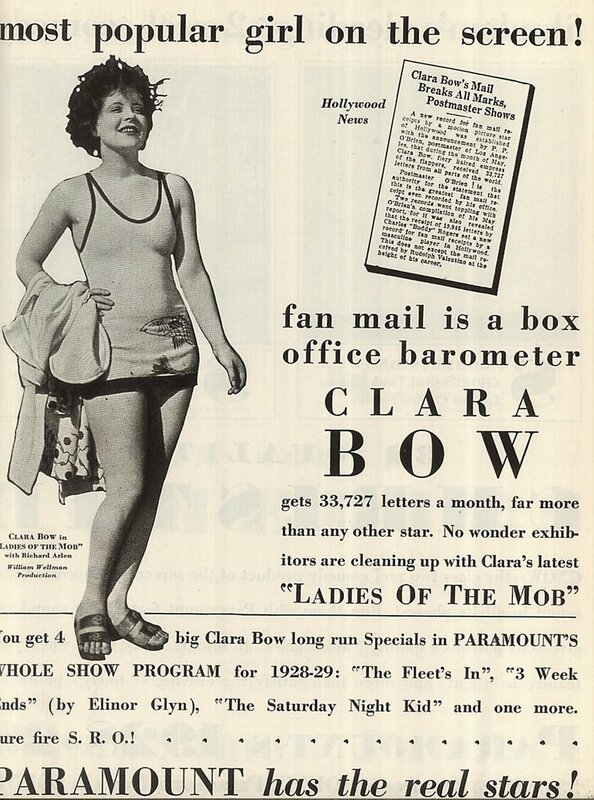 If Clara had been better equipped to articulate her talent, if only she’d had a little more formal education and come from at least a marginally functional background, she might have been recognized as one of the truly distinguished actresses of her generation. 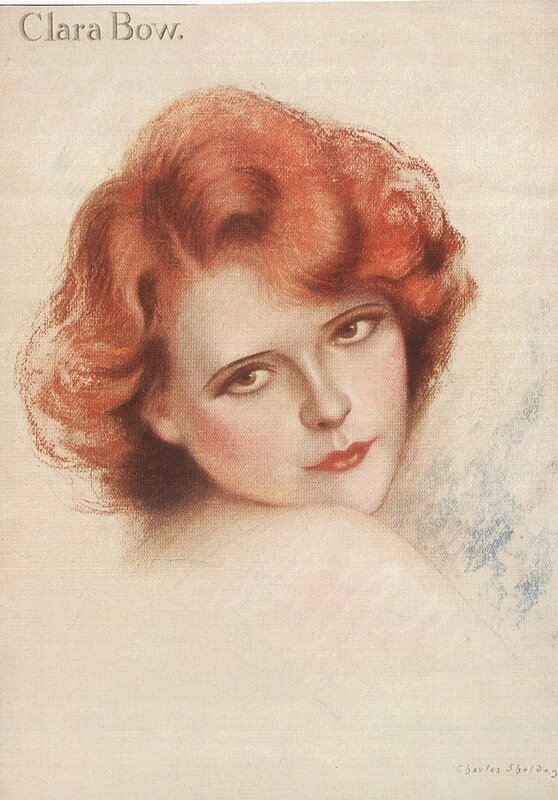 But then, she wouldn’t be Clara Bow anymore. Instead, she might be Colleen Moore, or Sue Carol, or any one of those runner-ups so much better equipped at the time to protect themselves against the studio threshing machine that eventually finished Clara off. To hear observers tell it, and these were the top people in the business, Clara Bow was the most capable actress they’d ever worked with. Victor Fleming was still saying it twenty years after the fact, and he’d directed all the biggest names during that interim. We could appreciate Clara more if Paramount hadn’t allowed most of her pictures to rot. 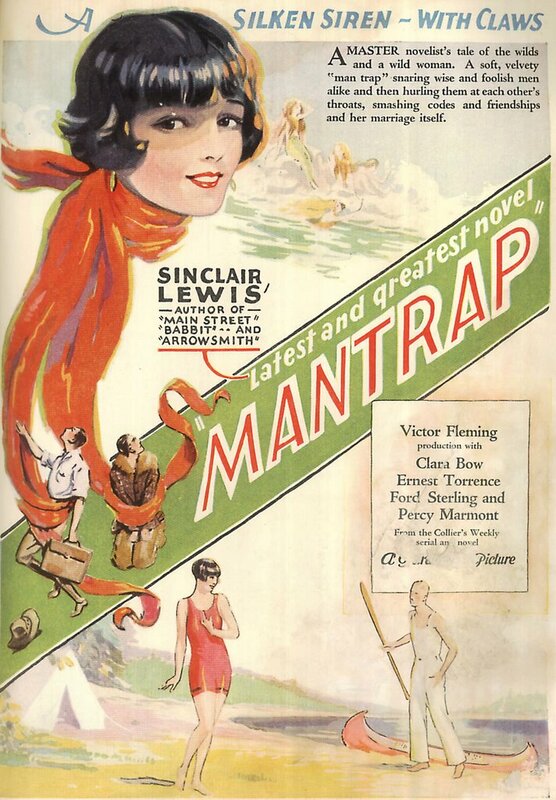 Even the few that are left remain largely quarantined --- Wings, ManTrap, and Hula survive, but their copyrights were renewed, so that steel trap is resolutely shut. The silent Bows in circulation are earlier, less polished efforts, and surviving elements for these are mostly 16mm. The Plastic Age, Dancing Mothers, Parisian Love --- all reveal glimpses of the magic, but not to Clara’s best advantage. Of those available, It alone gives us a shimmering Bow --- the DVD (and do please opt for the Milestone version, for it's by far the best) offers the sort of Clara Bow viewing experience audiences routinely enjoyed during her heyday. She was my mother’s favorite actress --- a ten-year old the year Clara made It. What’s left of her generation (my mother’s 89) is now the sole repository for first-hand memories of these --- Red Hair, Three Weekends, The Fleet’s In, Get Your Man, Rough House Rosie, Ladies Of The Mob --- the list of the lost goes on, and it would take an archiving miracle to turn any of them up now. Should you want to see mere actors exposed as such, look at Clara Bow’s supporting cast in 1927's It. They function well enough --- adequate is the word best applied --- but it’s Clara really lighting up the place, and not just because the movie’s thrown to her. Every move and gesture is spontaneity itself, a primer on how to transcend limitations of a projected image in order to reach out and become one with your audience. She would soon enough become the pivot around which Paramount’s entire movie season would revolve. Exhibitors accepted any number of dogs in order to get a four per year serving of Bow that was part of the studio’s block book. The fact they were working a hopeless insomniac at eighteen hours a day was the insidious means by which those contracts got fulfilled. Quality was incidental since the public was buying Bow any way they could get her. She was their sow’s ear to silk purse girl, and formula though they were, her silents kept right on selling, almost despite themselves. 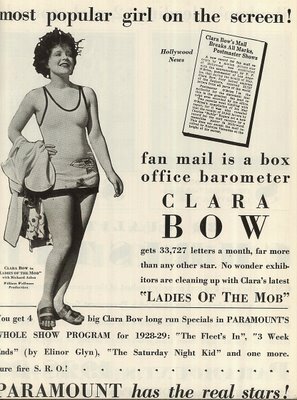 Her jazz baby thumb-nosing at convention was endearing for a while, but Clara flew in the face of too many Hollywood sacred cows, and she was made to suffer for it by way of social outcast status unheard of among stars with her boxoffice cache. The men were there in droves --- she was well known for putting out, but that was just another reason for much of the town to hate her. Conquests (hers, not theirs) included the aforementioned Vic Fleming (here’s the two of them together), Gilbert Roland, a starting-out Gary Cooper --- she liked Cooper because, as she put it, he let her dog share the tub when he gave Clara morning baths. Scandal rags got in their licks, tall tales thrived right into the seventies with the publication of Hollywood Babylon, a tickle-me wool gathering of filthy anecdotes, one of them alleging Clara had serviced the entire USC football squad during nighttime orgies in her home. Author Stenn put that story to rout by tracking down surviving team members. Based on their chaste, and believable, accounts of their association with Clara, these boys sound more like college students in The Plastic Age than any product of Kenneth Anger’s fevered imagination. This is how nice Clara could be to her fans. 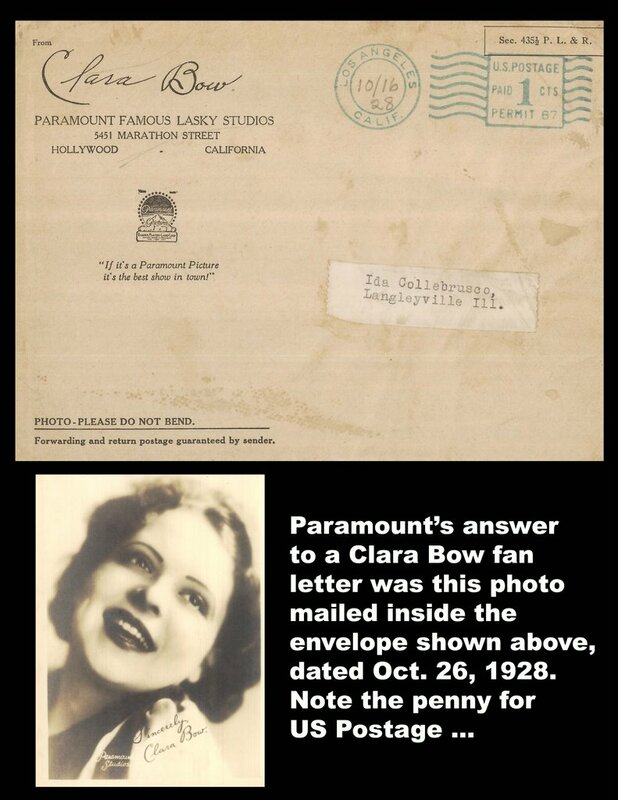 There was a kid who sent a letter to Paramount, lamenting the fact that his parent’s candied popcorn concession at Long Beach would soon go under owing to family illness and rising medical expense. Could Clara come down and help out? To the boy’s no doubt total shock, she did just that, showing up unannounced one Saturday morning to peddle the corn. All her idea too, not the publicity department’s. The 33,727 letters she received in May 1928 were no doubt sincerely felt. Nobody in the industry got more mail (here’s a trade ad touting the spectacular figure and a sample of the photo and envelope that went out to those thousands of fans). By this time, Clara was frankly sick of actin’ with my clothes off, but to the eternal gratitude of all and sundry (including us! ), she continued doing just that. The curtain would begin to fall with the arrival of sound, just about the worst calamity that could have befallen a star of Bow’s temperament and limitations. 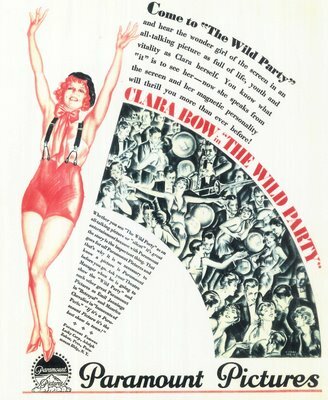 That story’s for Part Two, but for now, here’s an ad heralding The Wild Party, wherein Clara’s voice would herald the beginning of the end for her screen career. I have only seen It, but the thing that impressed me the most about Bow was the expressiveness of her face and how quickly and clearly she could communicate with it. That ability had to be handicapped by dialogue, as words are just too slow. I've seen clips of Bow from talkies, and it's like she's acting underwater, forced to wade through the dialogue instead of being able to let her eyes do the work. There was a 35mm print screening of WINGS at the Sunrise Theater in Southern Pines, NC last March. 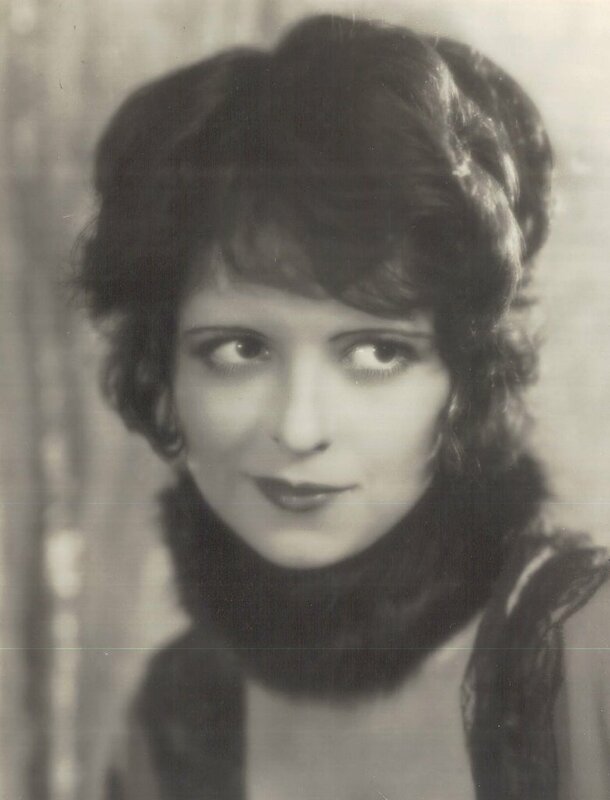 However what I believe made this screening special was the guest we had was Diana Cera Carey (Baby Peggy) who had known Clara Bow personally. Earlier that same day they showed a digital copy projected onto the big screen of Mrs. Carey's feature CAPTAIN JANUARY and let me tell you, there was not a dry eye in the house after this 1923 movie. It was a fun-filled day for silents with live piano music provided by David Drazin from Chicago. Only two comments for Clara Bow? For shame - she was a stunner! Old post, I know, but I had to check out my Clara first after "following" your blog! It's terrific! Thanks for the kind words, Avalon, and very glad you liked the Clara post!